While hiking up Kwanaksan on Saturday with some friends, we came across several of these sacs of little creatures on the bottom of the still parts of a small stream. The sacs were about the width of an index finger. In the water they looked spiral in shape and had a kind of milky translucency. Given that they were not completely transparent it was hard to make out what was inside (particularly without my glasses!). 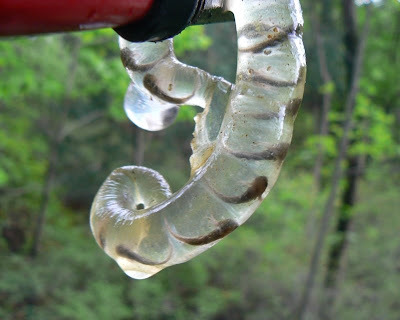 One of my friends suggested that they were salamander eggs. Does anybody know what these creatures might be? Of course we very carefully placed them back exactly where they came from after the photo shoot. Supporters of a "One China" assemble in downtown Seoul on Sunday while a lone "Free Tibet" proponent (with the yellow balloon) looks on. 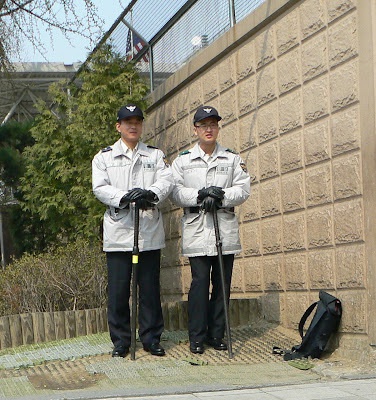 The Olympic torch relay came through Seoul on Sunday afternoon along a route that was kept secret until the last minute. 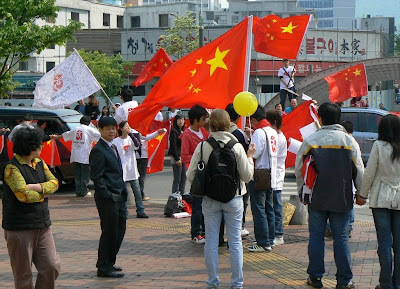 Yesterday the newspapers reported a number of unfortunate incidents where large numbers Chinese students, using their democratic right in South Korea to demonstrate in support of their government (ironically a liberty not afforded to foreigners in their country), assaulted individuals critical of China's handling of North Korean refugees and of China's policy on Tibet. 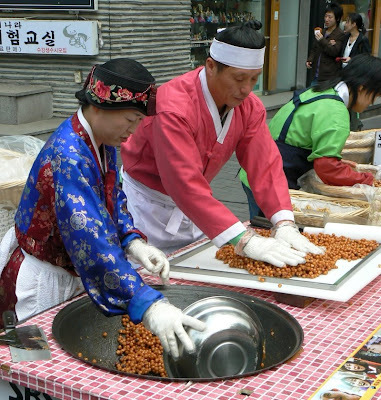 Vendors in traditional attire at a street stall in Insadong prepare a tasty treat. 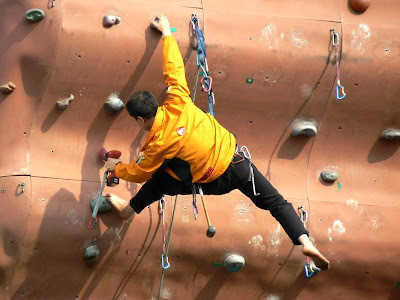 A man removing and replacing holds near the top the climbing wall in Boramae Park. He very skillfully climbed his way up and along a significant overhang without being belayed from the ground, clipping-on to anchors in the wall as he went. 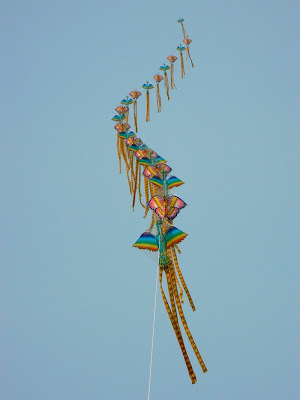 A set of 'stacked' bird kites all flying from the the same string tied to a post beside the Han river at Yeouido. Today is ANZAC Day (ANZAC stands for Australian and New Zealand Army Corps). As an Australian, this day, the 25th of April, has great significance. It commemorates the anniversary of the first major military action fought by Australian and New Zealand forces at Gallipoli during the First World War. ANZAC Day is not a celebration of war; it is a day to reflect on the sacrifices made during that terrible war and in all armed conflicts since. More information about the ANZAC tradition may be found here. The above photo was taken this morning at the War Memorial of Korea where I attended the ANZAC Day dawn service. 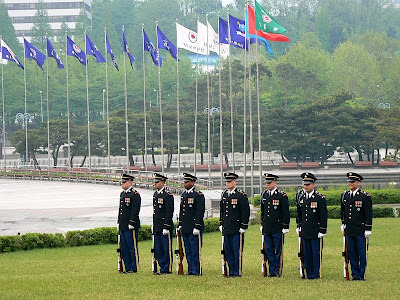 It shows a US Military Honour Guard who fired 3 volleys during the service. Both the Australian and New Zealand Ambassadors spoke during the service which was attended by a couple of hundred people, including various Military Attachés and Australian and New Zealand nationals. 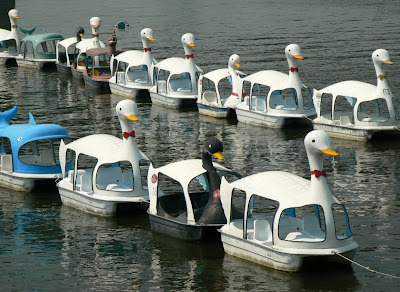 Two lines of pedal boats waiting to go into service on the Han River. A photo of the boats in action may be viewed here. 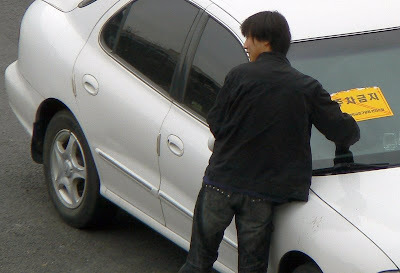 If you park your car where you are not supposed to at Seoul National University you are likely to find a large yellow sign stuck to your windscreen, as this gentleman discovered upon returning to his vehicle. I'm told by those in the know that these signs are VERY hard to remove. I love this time of year in Seoul. The weather is mild (my Korean friends say it is warmer than is usual), the hills are greening up (with more shades of green than I thought possible) and flowers are everywhere. The above photo was taken on Yeouido Island on the weekend. 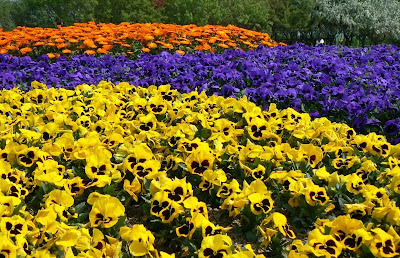 I think that they are pansies at the front/centre and maybe marigolds at the back. 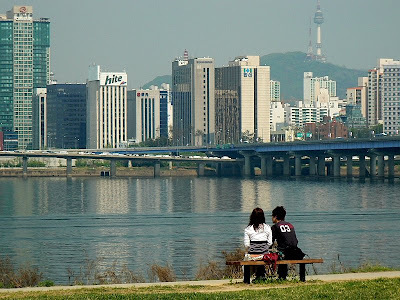 A young couple enjoying the view, and each other's company, beside the Han River, Yeouido. I saw this chap riding his bicycle in Yongsan. 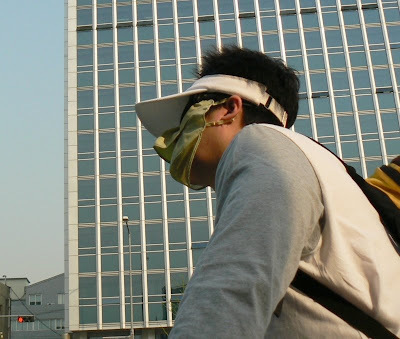 Many Seoulites wear masks to protect themselves from breathing the yellow sand (Asian Dust) that descends upon the Korean peninsula from Mongolia and China during the spring. However, so far, I have not seen too many like this one with the special nose-piece. No, this not a photo of a flying saucer from the 1960s, although that's the impression I was trying to create. I have actually been playing around with IrfanView, a freeware photo viewing and editing program. 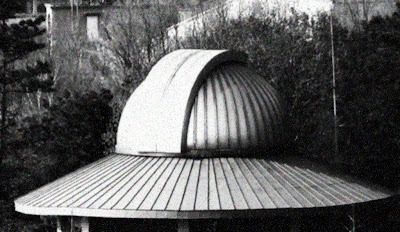 The object in the photo is in fact the dome on top of the observatory in Seoul Science Park in Nakseongdae. The original pre-doctored photo may be seen here. The Science Park features a number of outdoor exhibits demonstrating various scientific principles. While on the topics of science and space, Korea's first astronaut, Yi So-yeon, returns to earth today at about 5:30 pm Seoul time after having spent the last 10 days at the International Space Station conducting scientific experiments. Let's wish her a safe return to terra firma. Several items for the price of one today. Firstly there is the lovely floral display outside the shrine to General Kang Gamchan. There is the mirror with its little protective roof (mirrors seem to be everywhere in Seoul, particularly at the subway stations). 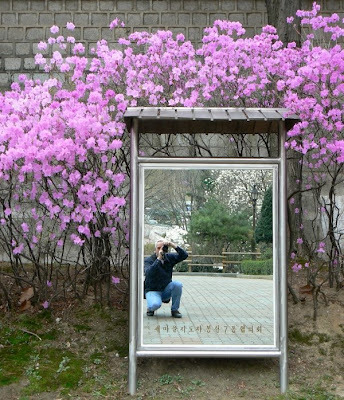 Then there is the reflection of the gardens in Nakseongdae Park AND a self-portrait of your photographer. 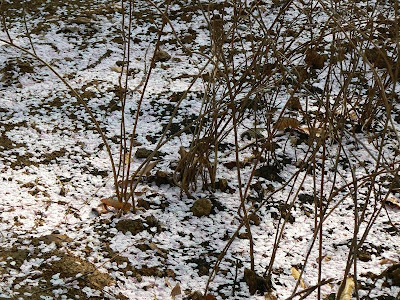 No, it's not a late snow fall; it's the carpet of fallen cherry blossom in Boramae Park. The blossom was beautiful while it lasted but much of it has fallen and the trees are now greening-up. However, the petals manage to put on one more show before they disappear completely. 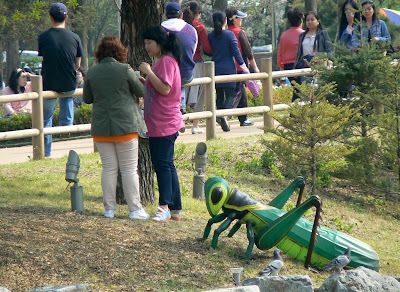 No, these poor unsuspecting women are not about to be devoured by a giant grasshopper; it's just one of several over-sized insect models in Boramae Park. I saw this object in Yeouido. Any ideas what it might be? Clicking on the image above may also give you a clue. 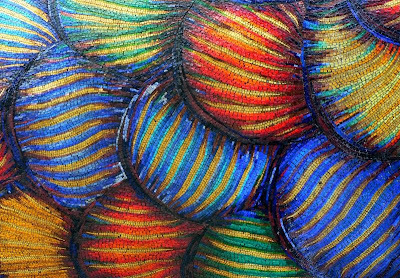 It is just a small part of a much larger object, so you will need to take the "scale" into consideration. When you've made your guess click here to see what it is. The weather was idyllic yesterday so we spent most of the afternoon in Boramae Park. 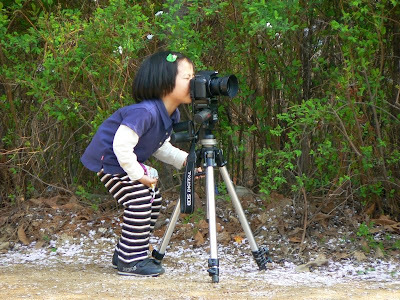 Saw this very professional looking little photographer hard at work taking pictures of her dad on the hill at the rear of the park. 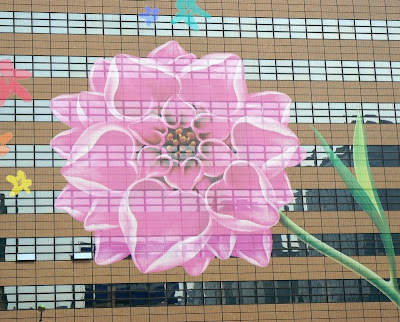 The Yeouido Spring Flower Festival is running at present. 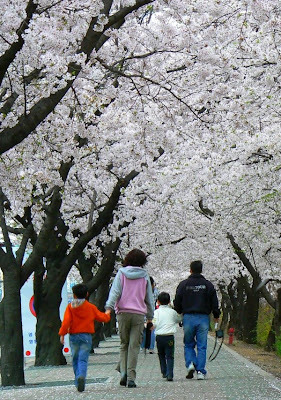 It is supposed to be Seoul's biggest cherry blossom festival. When the wind blows the blossom falls like snow. Today is my birthday. The photo above is of the remains of a birthday cake that I was given at work yesterday. 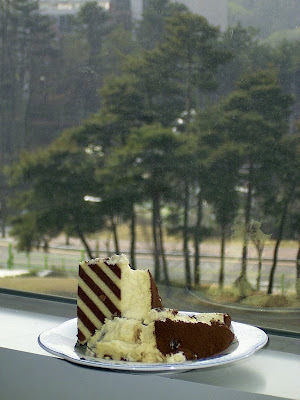 It was delicious and these last two pieces sitting on the window sill of my office did not survive the day. 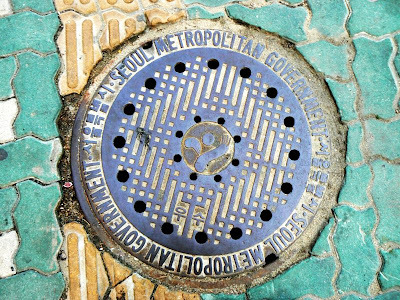 It's funny how you can live in a city and not notice something that is literally right under your nose. Every weekday morning for the last several months I have queued-up to catch the local green bus in Nakseongdae, but not really paid much attention to the ground upon which I was standing. Yesterday morning while reading my newspaper in the queue I looked down and noticed this personnel hole cover. I had seen plenty of these things before around the city, they seem to be everywhere, but this is the only one I have seen so far that has had the name of the city written on it in English. Anyway, I took this snap much to the amusement of the other folks in the queue! 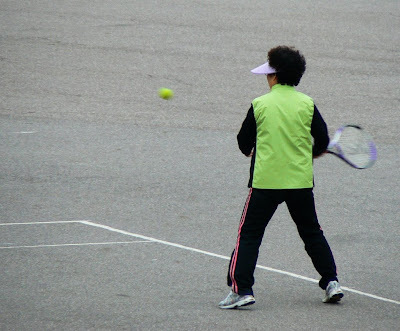 Yesterday morning a bunch of folks were playing tennis on the Cultural Event Plaza at Yeouido. I caught this energetic lady winding up for a winning forehand. 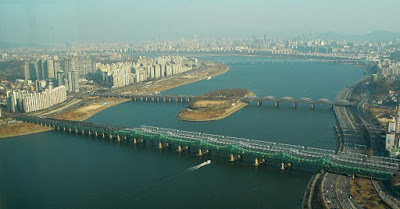 I travel across the Han River twice every day on the way to and from work, but I never tire of the view of this mighty water way. The Han is constant but every day somehow appears new and different in the changing light, weather and air quality of Seoul. This shot was taken looking to the east from the 63 Building and shows some of the many rail and traffic bridges that span the river. 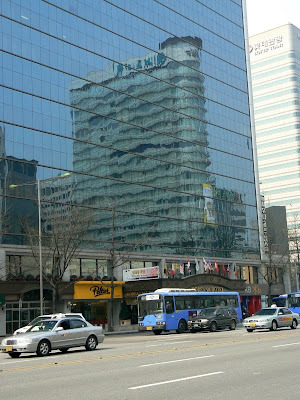 The glass front of the Koreana Hotel acts like a mirror and offers a shimmering mirage-like reflection of a building on the other side of the street. In this photo there are also two forms of public transport, a taxi and two blue buses. 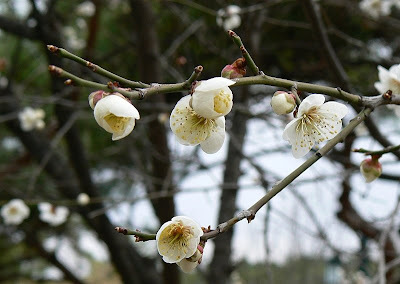 On the theme of Spring again, blossom and flowers are now appearing everywhere. 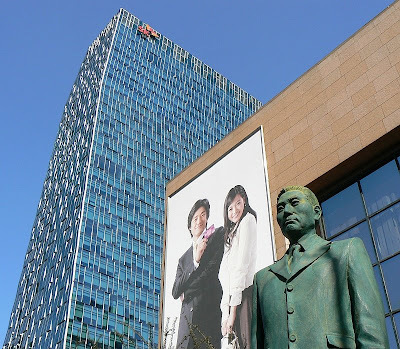 This also includes the front of the Kyobo building in Downtown! Policemen on duty outside the United States Embassy. You can just catch a glimpse of the Stars and Stripes at the top centre of the shot. Blossom on a tree near Chungmuro subway station. Although we continue to have persistent cool weather, it is beginning to look like Spring really has arrived. 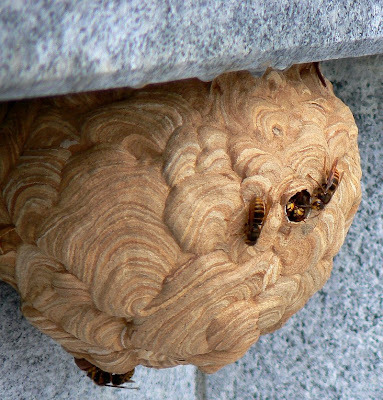 While my Korean friends tell me that these are bees, they look more like wasps to me. I found this volleyball-sized colony under a ledge on a memorial at the Seoul National Cemetery in Dongjak-gu. I was a little nervous about getting too close and so I took the shot with the zoom function and thus this image is a little out of focus. One evening, a little while back, I heard what sounded like explosions coming from outside. I opened the blinds on my living room windows to see fireworks bursting over a building opposite my apartment block. I grabbed my camera and captured the above photo. 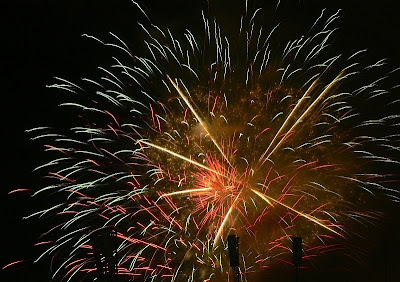 Although you can see telecommunications antennae in silhouette at the bottom of the shot, I am reasonably pleased as to how this turned out, as I have not had much success with photographing fireworks in the past. The Coach Captain of the No. 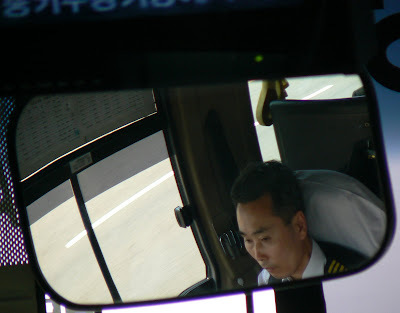 601 Airport Limousine (Incheon to Yongsan) bus reflected in his rear-view mirror. For 8,000 Korean Won (one way) the cream/yellow coloured Limousine buses are the most cost-effective means of getting from Incheon International Airport into the city.